I was a fat girl. I was the kid who never met a cookie, cake, pizza, sugary breakfast cereal, donut or ice cream she didn’t like. I didn’t really have a shut-off switch, and never learned to practice self control. I drank Kool-Aid with extra sugar with my dinner every night. McDonald’s Happy Meals were a staple in my house. I would sneak three Oreos from the cookie jar, eat them, and THEN ask my mom if I could have some Oreos and I would eat three more. I shopped in the “Pretty Plus” section at Sears. My brother, three years my senior and a normal, healthy weight, found my growing weight problem the perfect tool to use against me. When I irritated him, which was almost daily, he would call me the Blue Whale. Eventually, he and his friends morphed that into Blue Shamu because it had a nice ring to it. Kids in the neighborhood heard him call me that and soon everyone was calling me that. I remember getting off the bus one day after school, and several kids stuck their heads out of the bus windows as I was walking away and shouted “Blue Shamu, Blue Shamu!” at me. It was devastating as an eight year old. I still think of it from time to time if I’m wearing blue. I took tap and jazz lessons as a kid, for several years. As I started to gain weight, I started to feel more uncomfortable in my leotard and tights. My mom took notice and suggested it was time I go on a diet. I was bigger than all the other girls in the class. I feigned stomachaches before class so I wouldn’t have to go. Eventually, my mom said she wasn’t paying for classes I wasn’t attending, so that was it for tap and jazz at Miss Shirley’s Dance Studio. I was sad but also relieved. 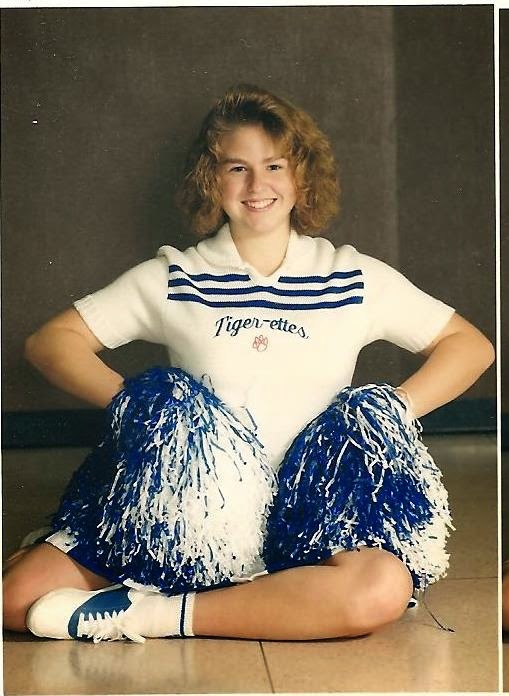 In junior high I tried out for the Tigerettes, our school’s dance team. Basically, it was what all the girls who didn’t make cheerleader did. You still got to wear the cute cheerleader outfits, but you did a choreographed dance at half time instead of cheering during the game. At my first football game, some boys walked by me and said I was one of the ugliest cheerleaders they had ever seen. I cried that night, and no doubt soothed myself with a big bowl of chocolate ice cream. My first year of high school there was this kid, Phil, who was in one of my classes and decided he didn’t like me for reasons I can’t remember. Anytime I would pass him in the hall he would act like there was an earthquake, because he said I was so fat I made the floor shake when I walked by. That was hard to absorb at 14. These are the memories that come to mind when I think about being a Fat Girl. No doubt there are many more, and if I took the time to write them all down it would be a Young Adult trilogy series. At 15 I decided to do something about my weight problem. I was tired of being the subject of scorn and ridicule. I didn’t have the discipline to starve myself, and somehow I managed not to develop a binge/purge problem. I asked my mom if I could go to Weight Watchers. I was the only kid in the group, which met in the basement of the YMCA. I bonded with middle-aged ladies who weighed me weekly on a scale set up behind a curtain for privacy. For the first time, I learned what a healthy diet was. I was only encouraged, never discouraged. It was a safe place, and I was glad I had found it. These were my people. I lost 45 pounds and became a Lifetime Member at age 16. I’ve gained that weight back, and lost it, and gained it again, and lost it. It’s a pattern in my life. I still sometimes go to Weight Watchers, and I’m almost 40. My inner Fat Girl is always going to be there. It has become part of my identity, and I suspect it will always be. As an adult, I’ve learned ways to cope with it. I’ve cultivated meaningful friendships with men and women who would never judge me by my weight. I’ve learned to treat myself gently, and to love my body no matter what size it is. But I still feel uncomfortable in my clothes sometimes, and worry that my face is too fat. I have a 14 year old step daughter, and I see her struggle with many of the same body issues I have. Is that a right of passage for every teenage girl? I am vigilant about not disparaging my body in front of her. I want to teach her to respect her body, to feed it healthy food, and to feel good about it no matter what it looks like. But I have no control over what other people say to her, the media messages she is bombarded with, or what happens to her while she’s at school. All I can do is be good to myself. I try not to equate my self-worth with my pants size. It isn’t always easy and I have my good days and my bad days. But really it starts and ends with me. It is essential for my well-being and health that I remain my own best friend. I don’t negate compliments I’m paid about my appearance. I smile when I look at myself in the mirror. When people tell me I’m beautiful, I choose to believe them. Because I believe I’m beautiful on the inside, and that shows on the outside, no matter what my physical appearance is that day. I am learning to actively cultivate my inner beauty and share it with the world. I want to present my true self to the world. And my true self is someone who has alot of issues about food and about weight. I want to show who I am regardless of what I weigh that morning. It’s a daily struggle, and it takes a lot of courage and self-awareness, and I have to be my own cheerleader, but it is a battle I think I’m winning.